s-Kadex, the latest addition to the Kadex family is the simplest and most compact electronic card reader from FingerTec yet! This latest automated access control device is able to function without any additional software, making it the perfect stand-alone solution for small businesses and homes where there is no need for tracking attendance. s-Kadex supports card family are still present to maximize s-Kadex’s value for money. The device’s size also enables it to be placed easily in any tight corner, making it a good fit for any situation. s-Kadex may be small and slim, but it still has enough processing power to ensure quick verification times of less than one second and enough memory to store a whopping 30,000 transactions! s-Kadex takes minimal effort to install because of the device’s simplicity, and coupled with its compact size, can be easily placed in any location of your choice. s-Kadex can be used as a standalone device for simple access management, making it perfect as a cost-effective and absolutely nohassle solution for your small business office or home. The s-Kadex’s simple outlook is complimented with a simple management system. Just key in your administrator password to start enrolling or deleting data. A buzzer and LEDs are built-in in s-Kadex to provide clear audio and visual notifications during any events that may occur at the device. 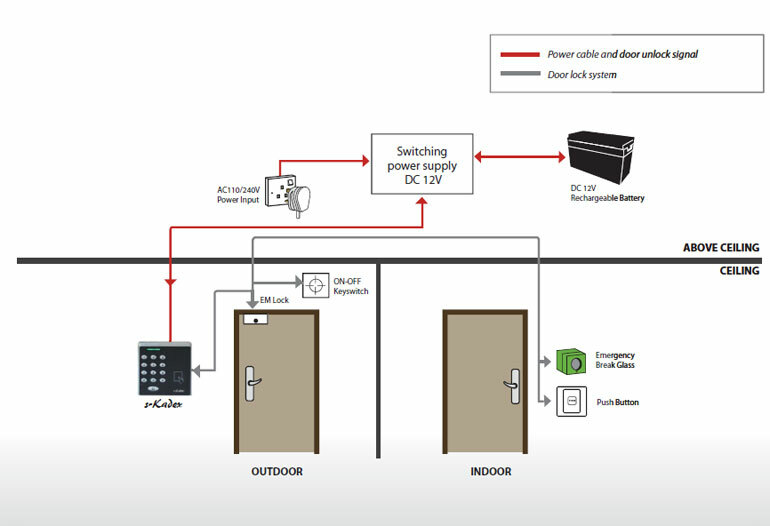 s-Kadex is compatible with all 12VDC/relay output electromagnetic locks and can also be connected to an NO alarm to provide added security to your space. To further secure your space, s-Kadex can accept four different combinations of card (either RFID or MiFARE) or password verification methods according to your preference.